French comic creators Lewis Trondheim and Nicolas Keramidas hit a phenomenal historical find some time ago, discovering an incomplete run of the long-forgotten Mickey's Quest comic book at a jumble sale. Within this obscure comic book, copies of which don't even exist in Disney's archives any more, there was a one-page serial titled "Mickey's Craziest Adventures". Together Trondheim and Keramidas have carefully restored and translated the surviving one-page strips and packaged them together into a 48-page collected edition recently released in English by IDW. Not really: it's all a fake-out. 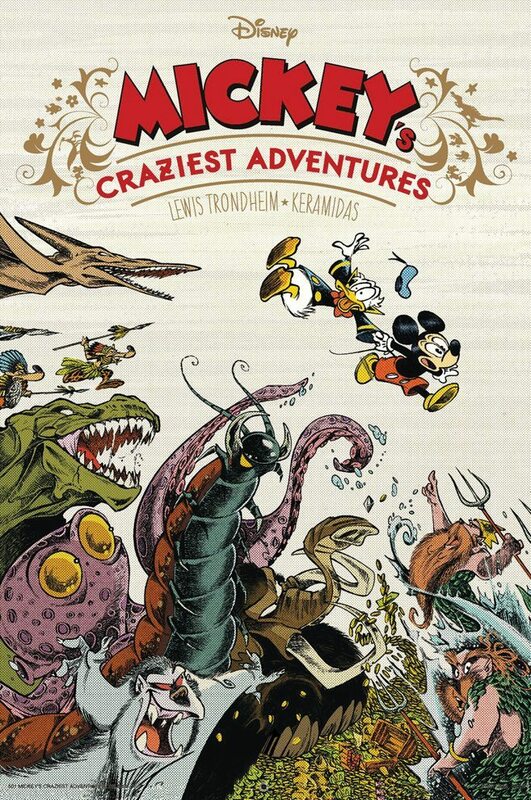 In truth Trondheim has written and Keramidas has illustrated a stunning and hilariously entertaining set of one-page strips themselves, replicating the tone and style of Walt Disney's old comic book serials with a jaw-dropping sense of accuracy. It really does feel like it is what it claims to be: a bunch of 1960s comic strips rediscovered after decades of obscurity. Readers drawn to the book based on Trondheim's past original works may go away disappointed, as the tone hews much more closely to old-style Disney than Trondheim's style. Readers looking for a clever new take on old-fashioned Disney comics with a distinctive artistic edge will enjoy this book enormously. Keramidas re-styles the classic Disney characters slightly to give them a more frantic and energetic look. This is a very kinetic graphic novel, with a huge sense of movement and speed from page to page. The characters feel a bit looser and more independent, and separate from their rounded, safe appearance in Disney's more mainstream publications. The colouring is wonderful, presenting a period-appropriate look, in addition to occasional tears, stains and burn marks on the artwork to simulate the 'found at a jumble sale' look. Trondheim tells a story very typical of Walt Disney comic books and serials: the villainous Pegleg Pete and the Beagle Boys team up and use a stolen shrink ray to steal Uncle Scrooge's money vault. Mickey and Donald team up to retrieve the loot, taking them from a a shrunken garden filled with insects to South America, ancient cities, underground and even to the moon. This breakneck pace is accentuated by the "missing" pages. As the comic book run Trondheim and Keramidas 'found' was incomplete, so too is this story. It is rare to read two instalments in a row; usually there is a gap of one or two issues between them, meaning you can be reading Mickey and Donald in one place at the end of one page only to find them somewhere random at the top of the next. It is the book's master stroke, managing to speed up the storyline enormously in a manner that is unexpected, innovative, and incredibly funny. There is a gentle strand of self-aware humour running through the book. At one point a character - ostensibly written in the 1960s - bemoans that mobile phones haven't been invented yet, because he wants to share his scientific discovery with others. In another sequence Mickey avoids a picnic with Winnie by implying he's having an affair with Daisy Duck (Minnie slaps him and leaves in a huff). It's certainly a book still suitable for children to read, but there's an adult edge to some scenes that really helps give the book its own distinctive style. This is a gorgeously packaged book, presented in an oversized hardcover edition despite its brief length (48 pages). For the Disney enthusiast and the Trondheim fan alike it is a must-read, but really it deserves a broader audience than that. This is genuinely innovative and hilarious stuff. It's one of the best graphic novels of the year.